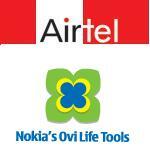 Nokia Ovi Life Tools are now available for Bharti Airtel subscribers. Nokia and Bharti Airtel joined hands to launch Ovi Life Tools service targeted at providing Airtel’s mobile customers with access to relevant content on agriculture, education and entertainment. The partnership between Nokia and Airtel will let the Indian users access to information available in a simple icon based, graphically rich user interface. Airtel users will be able to activate Ovi Life Tools on their mobiles and can subscribe to Ovi Life Tools starting at Rs 10 per pack. This service is available on a range of Nokia handsets including the entry level devices and is available in 11 Indian languages including Hindi, Gujarati, Tamil, Telugu, Bengali, Oriya, Assamese, Marathi, Malayalam, Kannada and Punjabi in addition to English. Agriculture Services : Personalised agriculture related information, weather updates, crop advisory and market prices of produce. Entertainment Services : Download wallpapers, ringtones, RBT, games, jokes, news etc.